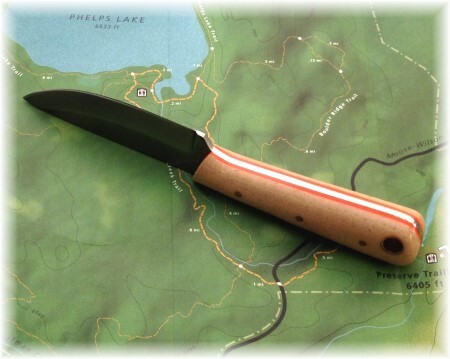 February - Fire Starting kit - Light my fire & Fire fixins! 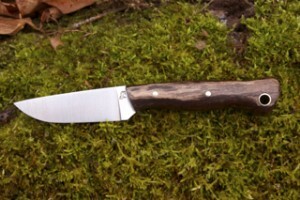 April - Large BHK "Tiger Knapp"
Flat ground with Brazilian cherry wood handles. 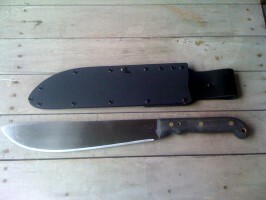 Size: 1/8" stock, 5 1/2" OAL,Cutting edge 2 5/16"
Size: 1/8" stock, 6 1/2" OAL,Cutting edge 2 1/2"-2 5/8"
1/8" thick blade made from 1095 carbon steel. 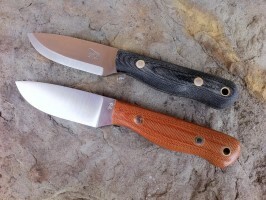 The sharpened edge is 3.25"
and a handle length of 4.5" and OAL of 7.75". 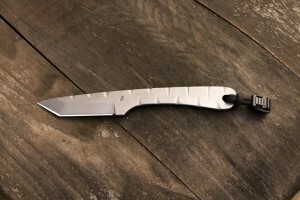 The blade itself is 3/32" of O1 tool steel, full grind. 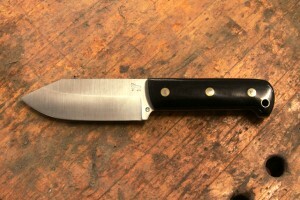 OAL is 5 3/4", with a 2 3/8" cutting edge. 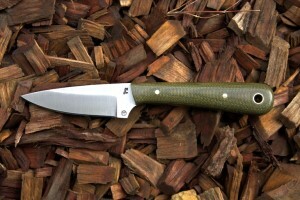 Scales are available in natural, green and black micarta with brass pins and an unlined lanyard hole. 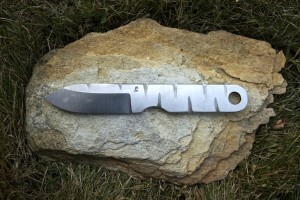 The blade itself is 1/8" of O1 tool steel, full grind. 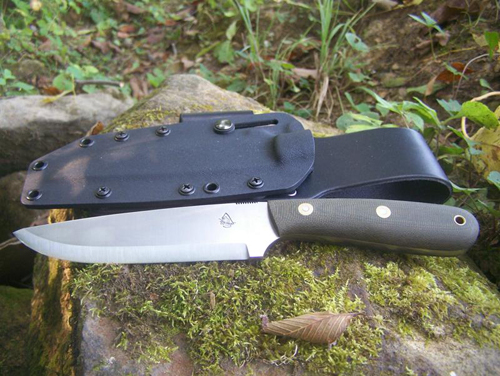 OAL is 9", with a 4" cutting edge. 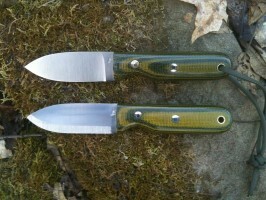 Scales are available in natural, green and black micarta. 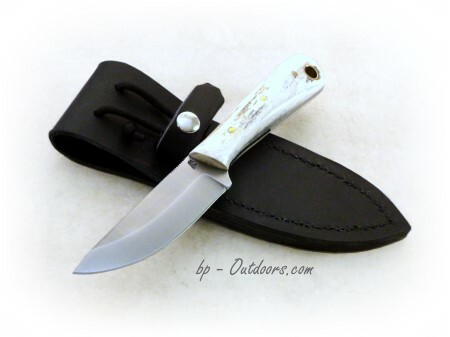 Catalog Price was $110. 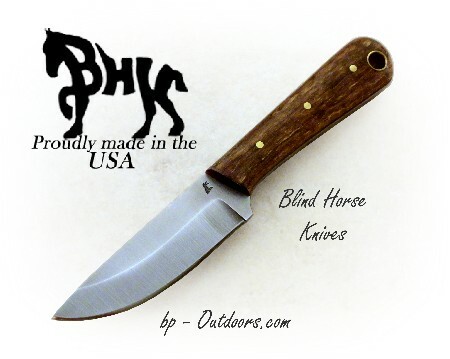 The Maverick Colts are O1 tool steel, full flat grind with a convex edge and measure 6-1/2 inches Overall Length with a 2 7/8 inch Sharpened Edge, leaving a 3 1/2 inch handle. 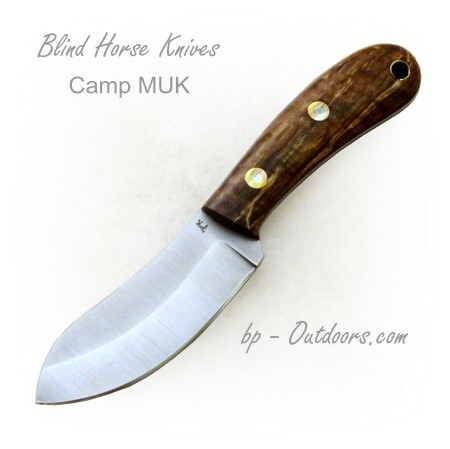 Overall Length 9 inches, Sharpened edge 4 1/4inches, Handle Length 4 1/2 inches, Steel Type - 01 tool steel, Steel Thickness 1/8 inch, Lanyard Hole Size 1/4 inch. 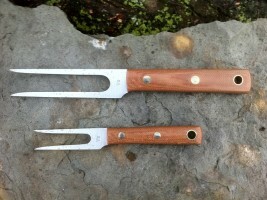 Large carving fork is the same size as the Scout knife 9" OAL, large fish eye bolts and large lanyard hole, stock is 1/8" 13C26 Sanvik stainless steel. 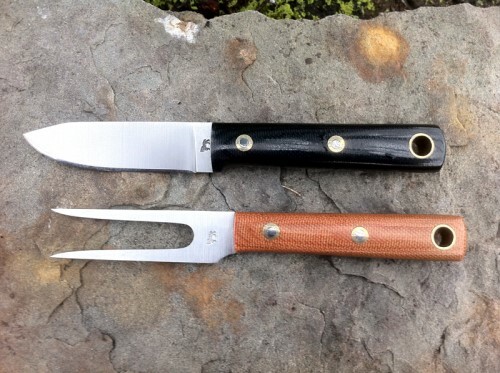 Monthly Special Price: Colt ($80 + Fork $40), Scout ($110 + Fork $60). 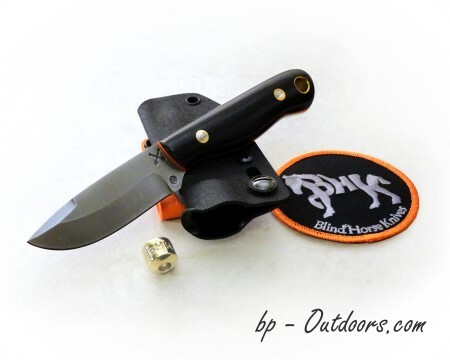 Size 6 1/2" OAL, Cutting edge 2 5/8", 1/8" Thick stock, 13c26 Stainless Steel, Sharpened spine, Large lanyard hole, Kydex sheath with Slide Lock Retention, Monthly Special Price: $70.00,$85.00 with small Tec-Loc. 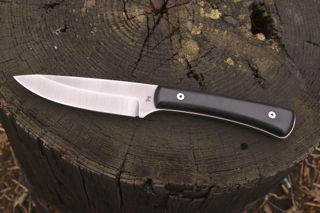 1/8" Sandvik stainless in the 13C26 variety - 6 5/8" over all length with a 2 5/8" cutting edge - Stabilized fiddleback maple & black G10 liners. 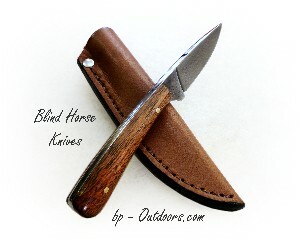 Large Workhorse knife is made from 5/32" D2. 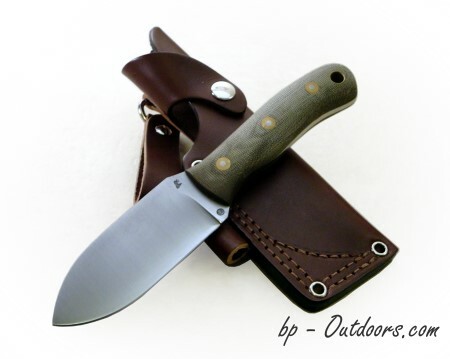 It has an overall length of 8 3/8" Sharpened edge of 3 3/4". 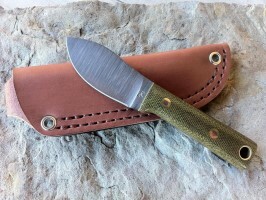 Small Workhorse knife is made from 1/8" D2. 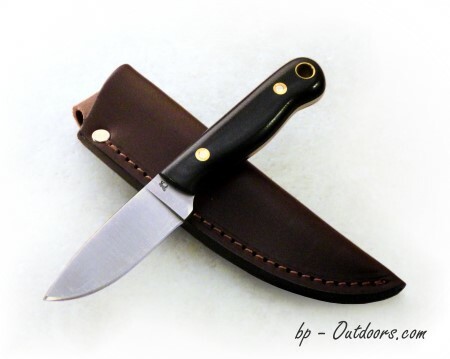 It has an overall length of 6 3/4", Sharpened edge of 2 3/4"
This 01 Steel, Scandi ground knife is built for heavy duty bush crafting. 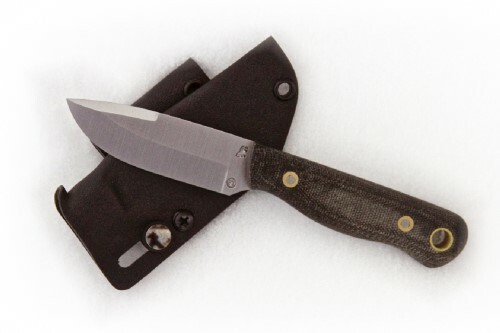 It is 3/16" thick with thumb serrations and a squared off spine, great for use with a ferro rod or fire steel. 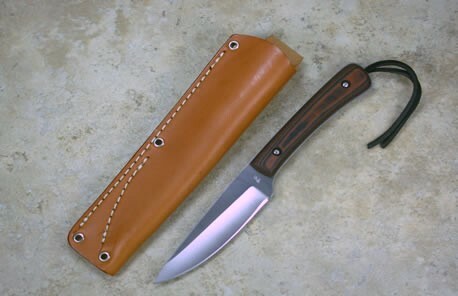 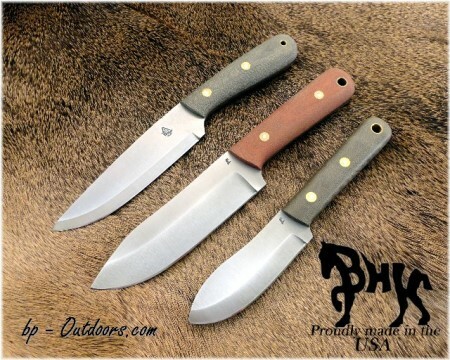 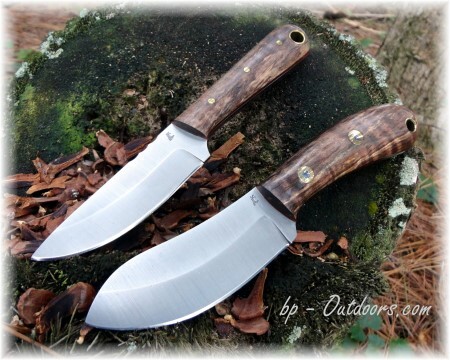 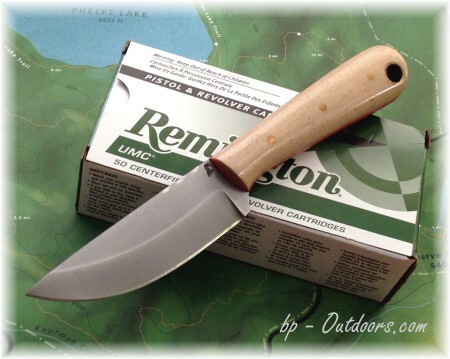 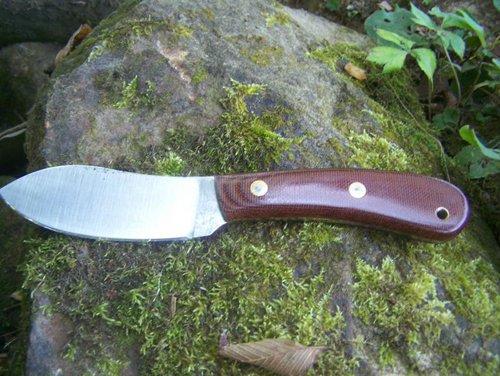 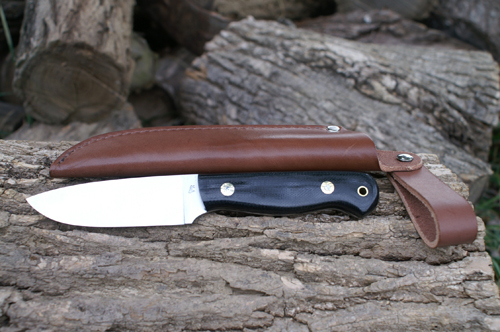 Specs are: 10" over all length, blade length is 5.5 ", blade width is 1 1/4" with a 4 1/2" handle. 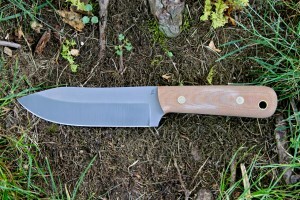 This 01 Steel, Scandi ground knife is built for heavy duty bush crafting. 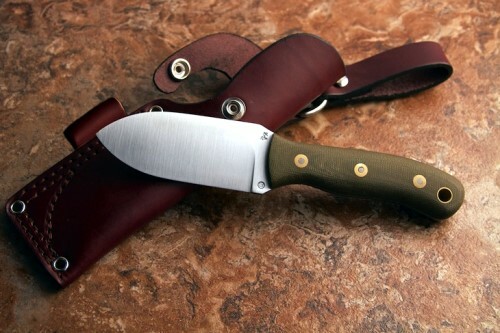 (smaller version of the Pathfinder 1) Price was $250. 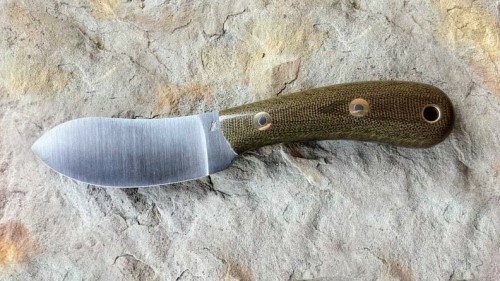 This 01 Steel, Scandi ground knife is built for bush crafting. 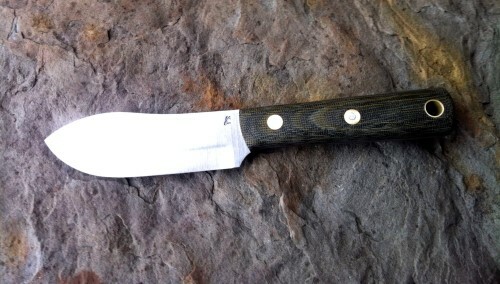 It is 5/32" thick. 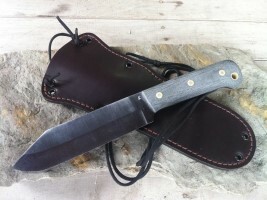 Price was $250. 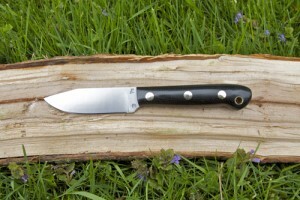 Made of 01 Tool Steel the Woodcrafter is a 4" Scandi ground blade that is 1/8" inches thick. 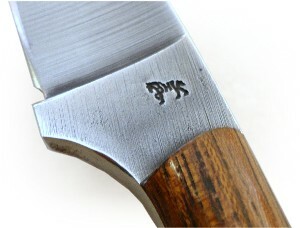 It also has a sharp back edge perfect for biting a firesteel and showering sparks for fire starting. 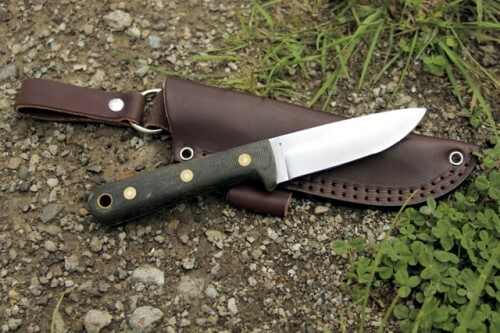 The grip is 4.5" inches and comes with polished green Micarta scales and black liners. 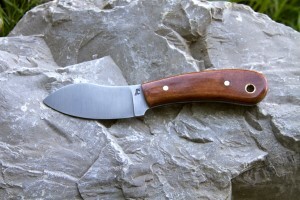 L.T. 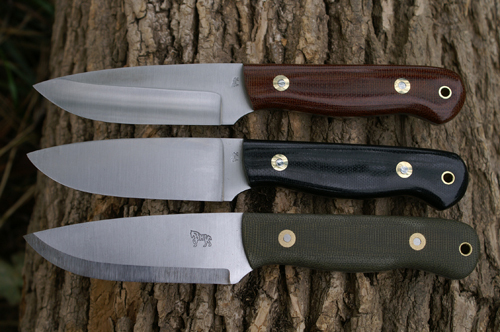 Wright makes knives for every day carry and any outdoors activity. 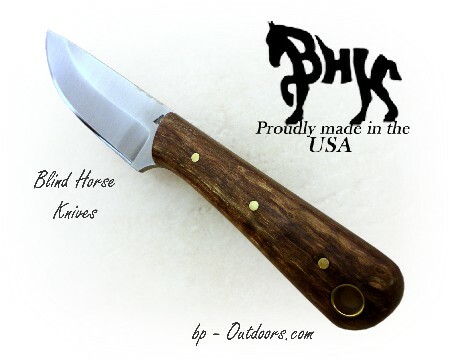 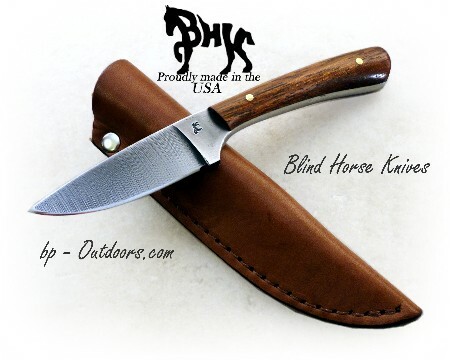 A partial listing of the Blind Horse knife designs include the Pathfinder, PLSK 1, PLSK 2, PLSK Scout, MUK, Camp MUK, Large Work Horse, Small Work Horse, Frontier Valley, Frontier Trapper, Frontier First, Small Workhorse, Bushcrafter, Bush Baby, Maverick Scout, Maverick, Colt, Woodsman Pro, Woodsman, Western Drover, Tiger Knapp, Brumby, Snap Knapp, Lumberjack Toothpick. 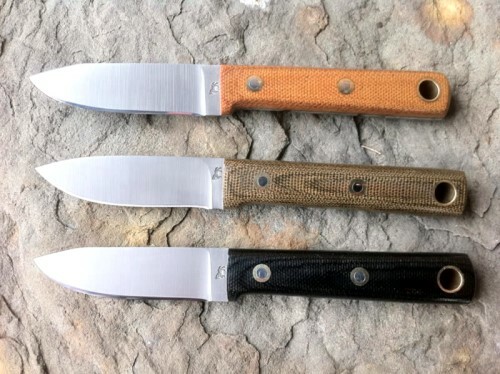 Monthly Specials include the Packhorse and Boat Tail - see detailed list below..
#1 - Length: 5 1/2"
#2 - Length: 6 1/4"
#3 - Length: 7 3/4"
#4 - Length: 5 7/8"
#5 - Length: 6 3/4"
#6 - Length: 9 1/4"
#7 - Length: 6 3/4"
#9 - Length: 8 1/4"
#10 - Length: 6 7/8"
#15 - Length: 5 7/8"
#30 - Length: 6 1/4"
Knives designed for EDC (Every Day Carry), hunting, camping, fishing, hiking and any outdoor adventure!